The White Truffle Festival (Mercato del Bianco Tartufo di San Miniato) is organized annually in the town of San Miniato located in Tuscany, Italy. The event is held on three last weekends of November. Tuscany has a long tradition of one product festivals called sagra. A town or a village, known for its gastronomic traditions, holds a fest dedicated to the local delicacy. The White Truffle Festival in San Miniato is one of such events. San Miniato area is a unique land favorable for growing the gourmet product. Local truffles are known not only for their quantity, but also for their high quality. White truffles from San Miniato are delivered to top restaurants all over the world. Abundance of white truffles in San Miniato is not only caused by nature favor, but also results from competent price policy and marketing of the valuable product. Care about the environment plays an important role as well. Local legislation enforces moderateness and selectiveness while collecting crop, and also controls time of picking up harvest. The season for picking up white truffles is only three not full months, October, November and December. The White Truffle Festival in San Miniato is highly appreciated by gourmets. Traditions of selling white truffles in San Miniato date back to the Middle Ages. However, to the full extent the business of picking up the delicacy was set up just a couple years more than a century ago. White truffle business has become in most cases a family one. Every family has its own secrets kept by generations, its own dogs trained to find truffles, its own spots in bluffs and forests. But white truffles are not just business and exquisite taste. The annual White Truffle Festival is a kind of an organizing center for cultural and industrial town life. 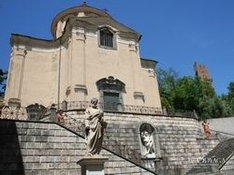 The fest takes place at the historical center of the town of San Miniato. The main stage for events is the Cathedral Square (Piazza del Duomo) located on the slope of a cliff. Besides the main delicacy, white truffles, the festival stands invite to get acquainted with other food common for this area. The White Truffle Festival turns San Miniato into a laboratory of taste for three November week-ends.